St. Patrick’s Day is right around the corner, and it wouldn’t be complete without some corned beef! 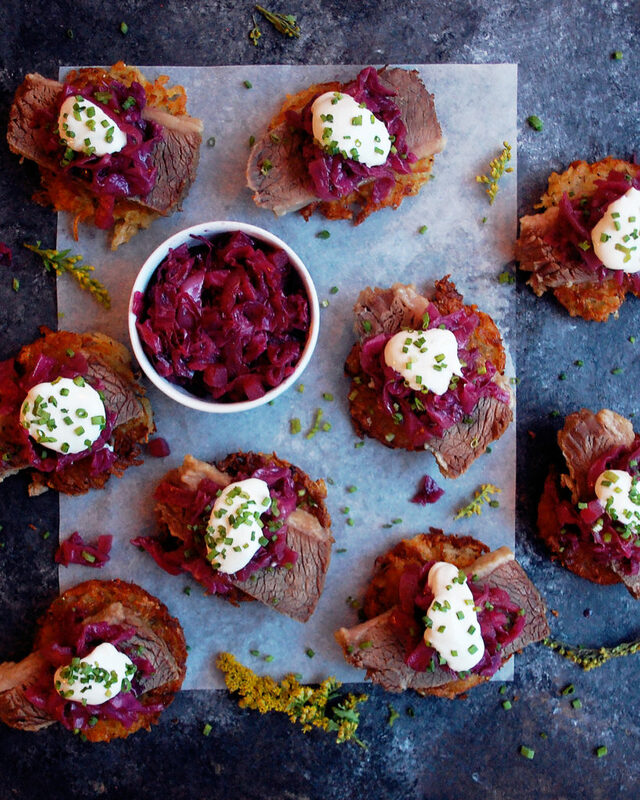 Making corned beef yourself is a much easier task than it may seem. If you can get your hands on a nice piece of brisket, and plan a few days ahead, you should be good to go. The process basically has 2 steps: brine and simmer. 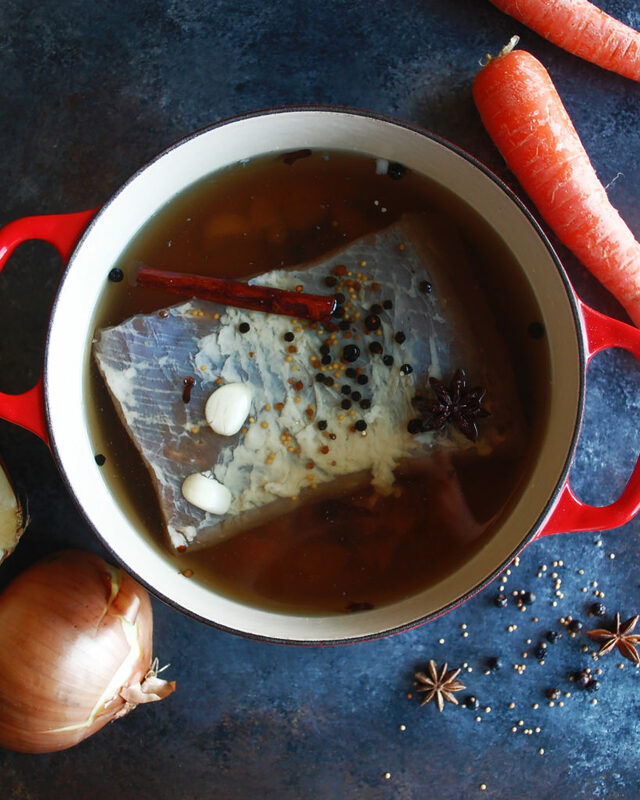 The brining liquid is as simple as bringing water to a boil with salt, sugar, and a bunch of different spices like cinnamon, cloves, mustard seeds, and juniper berries. Once cooled, the brisket sits in the brine for 3 days to absorb all the flavor. After that, I simmer the meat until fork tender and slice it thin. I didn’t end up searing the meat for this recipe, but I highly recommend it. The thin layer of fat melts, while the exterior of the meat creates a golden crust. Melt in your mouth goodness. On to the cabbage. When I was at the CIA, one of the recipes we had to perfect in our fundamentals class was a basic braised cabbage. So simple, but it honestly became one of my favorite recipes. 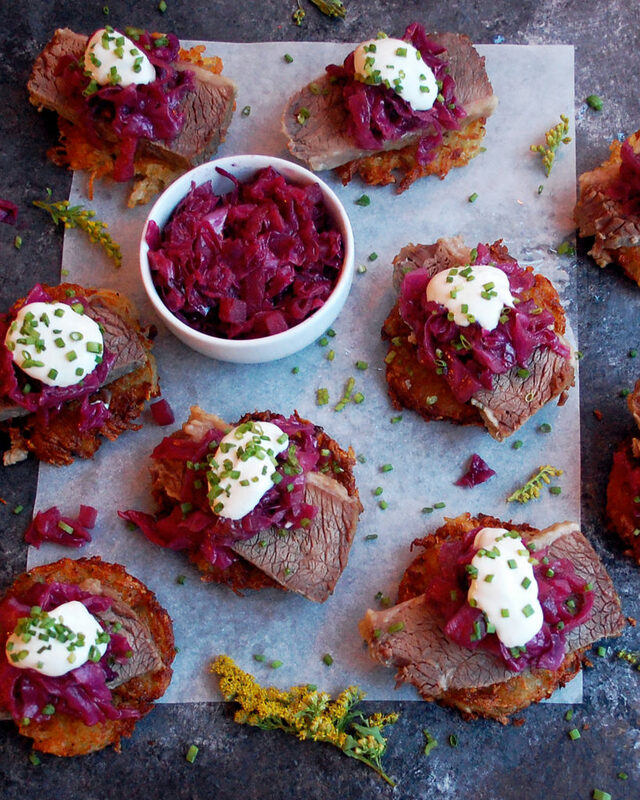 It starts with bacon fat, and ends with warm spices, vinegar, and sweet jam…all cooked down into a hearty little vegetable dish that is the perfect accompaniment for the salty corned beef. And finally, the potatoes. Just a few russet potatoes that get par-cooked and grated. 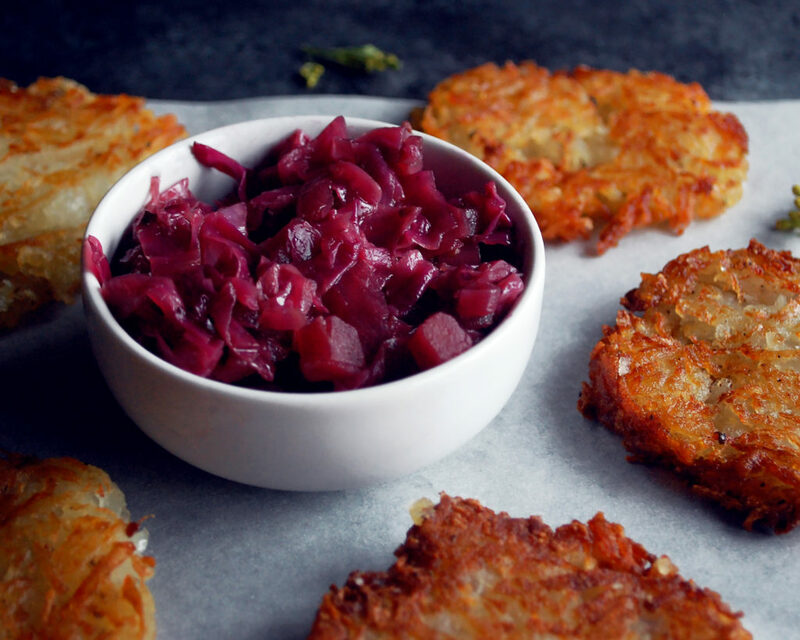 The par-cooking helps them glue together and eliminates the need for eggs, flour, or anything else you would think you may need to add to a potato cake. Just straight up potatoes, salt, and black pepper…pan fried in oil until golden brown. 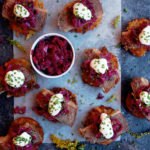 They are the best base to pile the corned beef onto, with a spoonful of braised cabbage, a dollop of mustard crème fraiche, and a sprinkle of chives over top. It’s basically St. Patrick’s Day stacked up into the perfect couple of bites. Enjoy! In a pot, combine the water, salt, sugar, cinnamon stick, peppercorns, mustard seeds, coriander seeds, garlic cloves, juniper berries, cloves, and star anise over high heat. Once the liquid comes to a boil, carefully transfer it to a large bowl. Pour in the ice. Let cool. Place the piece of brisket into the liquid. Cover it well and let brine for 3 days. After 3 days, remove the brisket from the bring and place it in a pot with the onion and carrot. Cover the brisket by 1” with water. Bring the water to a boil. Reduce the heat to a simmer and cook for 3 hours until fork tender. 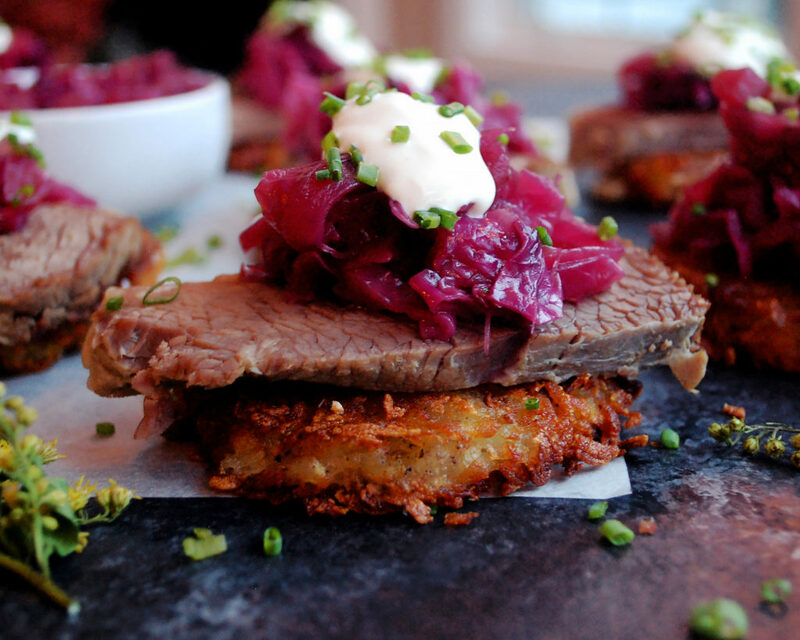 Thinly slice the brisket and keep warm until ready to serve. Whisk together the crème fraiche and mustard until incorporated. Season with salt, pepper, and a squeeze of lemon to taste. Refrigerate until ready to serve. Heat a pot over medium heat. Add the bacon fat and let melt. Add the sliced onions and apples. Sauté for a few minutes until soft. Deglaze the pan by adding the water, red wine, and red wine vinegar. Stir in the brown sugar and jam. Make a sachet (see notes) to hold the juniper berries, cloves, and cinnamon stick. Toss that into the pot. Let the liquid come to a bubble. Add the cabbage. Let the cabbage simmer until the liquid has reduced and the cabbage is tender, about 30-45 minutes. Season with salt and pepper to taste. Preheat the oven to 400 degrees F. Place the potatoes into the oven and bake for 30 minutes, just until warmed and slightly tender. Let the potatoes cool slightly. Peel off the skins and use a cheese grater to grate them. Transfer the grated potatoes to a bowl and mix them with a generous seasoning of salt and pepper. Use a ring mold to shape the potatoes into round little cakes, using your fingers to press the grated potatoes into the mold. Once all the potato cakes have been formed, heat a ½” of canola oil in a large sauté pan over medium high heat. Once the oil is sizzling hot, work in batches to fry the cakes. Be very gentle with them. Do not flip the potato cake until it is fully brown and moves easily, or else you will break it. 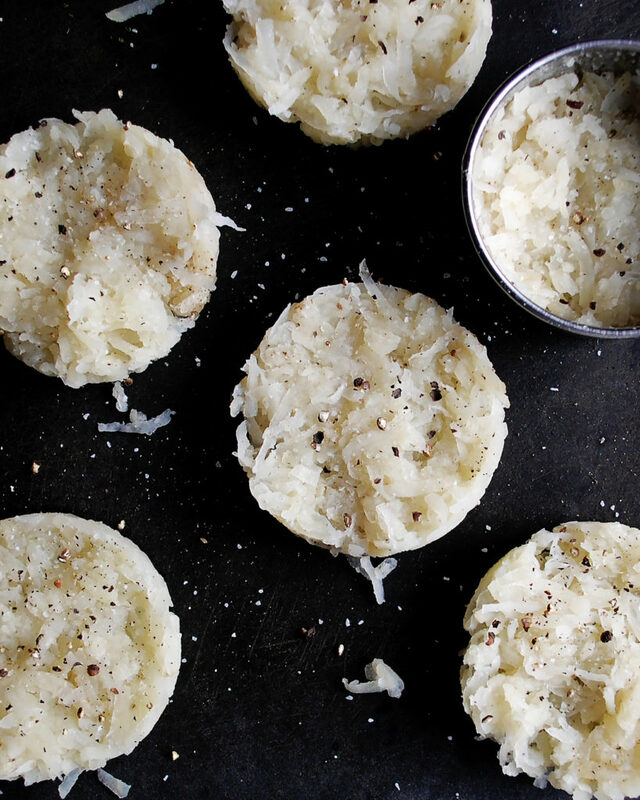 Once brown on both sides, transfer the potato cakes to a paper towel lined sheet tray and season with a little extra salt. 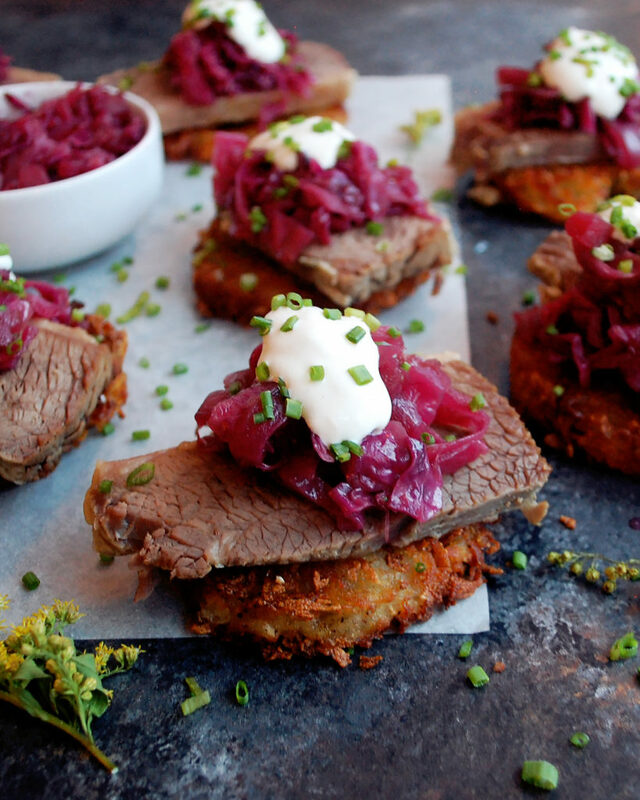 Serve a couple slices of corned beef on top of the potato cakes. 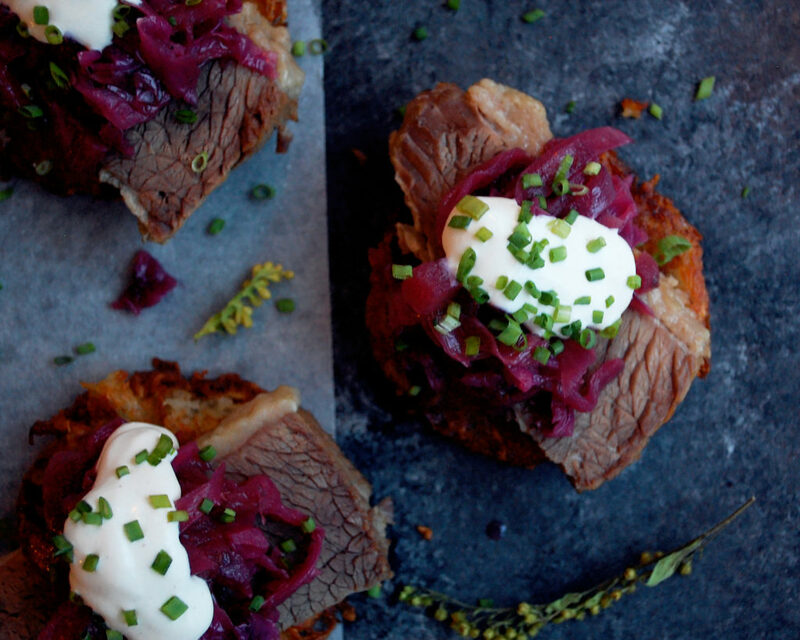 Mound a spoonful of cabbage on top of the beef with a dollop of mustard crème fraiche and a sprinkle of chives. A “sachet” is made by cutting a piece of cheesecloth into a square. Place your spices or any “loose” ingredients into the center of the cloth. Wrap the cloth up like a purse around the spices and tie it together with a piece of kitchen twine. You can then add it to braises, soups, stews, etc. in order to get all of the flavor from the spices without having them loose in the liquid. Thanks Caren!! I appreciate it. Looks good and nice photography!! Thank you, Mario! I appreciate the kind feedback. These sure were tasty!